I am in love with my new scarf, as you can see! Ta da!! The finished piece- I love it! Pumpkin of the sea. All three carved pumpkins- On the left, an owl which I think also looks like the Cheshire cat and in the middle, Snooki Pumpkin! Jersey Shore! (p.s. I do not endorse watching that show...) As you can see we had a lot of fun with our pumpkins! The next morning, a few of us went on a small hike which happens to be my first ever mountain hike! Coming from Saskatchewan, we don't see a lot of hills so hiking is rare. I AM out of shape, however, and should probably start exercising before we go on a longer one...But check out this magnificent view we saw when we reached the summit! It was fabulously beautiful! Especially with all of the changing colours of the leaves. Breathtaking! When I am in the woods, my thoughts always turn to thinking we are going to see run into a bear- I am happy to report that we did not see one bit of dangerous wildlife! Only an abandoned car and a few beer bottles which don't quite seem to indicate toward natural inhabitants! What kind of hiking/nature stories do you have? 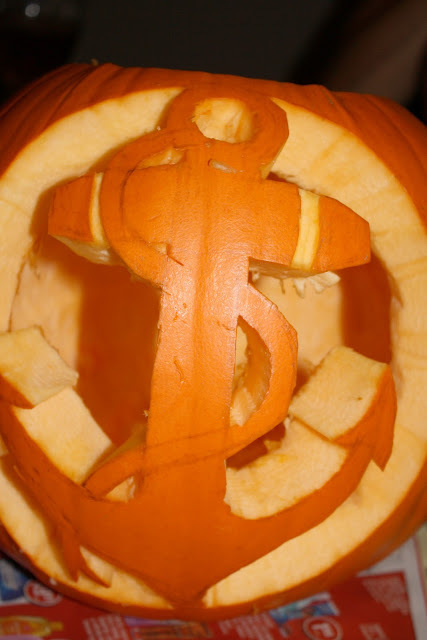 I love the anchor pumpkin! so cool! 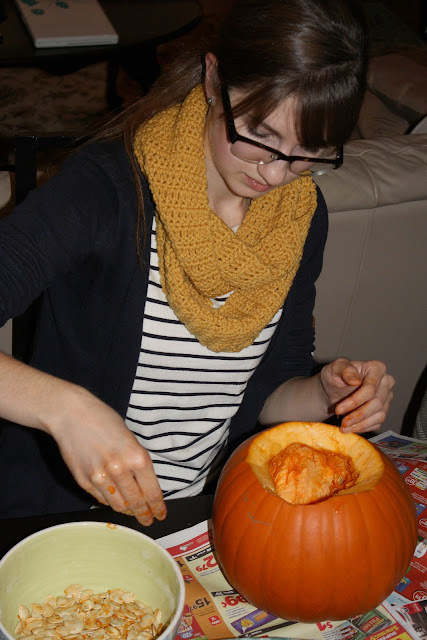 Any tips on the best way to carve a pumpkin? hmmm.... I guess I would say, do not do anything too small as it is hard to carve and always draw out your template first! Also, don't pick anything too complicated unless you are a pumpkin carving master! Your pumpkin looks fantastic! My husband is doing ours this year - I'm guessing he'll make it into some sort of Star Wars character, because that's his thing :) I live in AB and when we go hiking I'm always on the lookout for bears! I've only ever seen one twice - and both times I happened to be on horseback and we saw the bear in the distance so were able to hightail it out of there pretty quickly! Love the pumpkins! Quoting someone looking over my shoulder - "Argh matey! Ever been to the sea?" I'm afraid I've passed my fear of bears on to you. And I have never seen one on a hike (although your Dad and I did hear a lot of rustling at Greenwater Park once. If you get the chance to hike Mount Baker, do it. It was a strenuous one when I was your age,and I'm sure we never reached the peak, but I've always felt like that was my hiking pinnacle in my life! Your pumpkins look great! My latest hiking adventure included 100+ stairs in ballet flats! I'll have to plan better next time..